2016 AOA National Show 1st Place! Vinnie's 2018 histogram is back. At 9 years of age, still has 21.3 MFD, 3.8 SD CV of 17.7 and fibers greater than 30, 2.1%! Check it out! Are you looking for a girl to jump into your show string and get some immediate satisfaction and recognition? JLFA Peruvian Gia now has produced the girl to do that!! They say a picture is worth a 1000 words – so one look at her pics and you can see she is spectacular! We all try to breed to improve the next generation from our dams and we hit the jackpot with Gia. 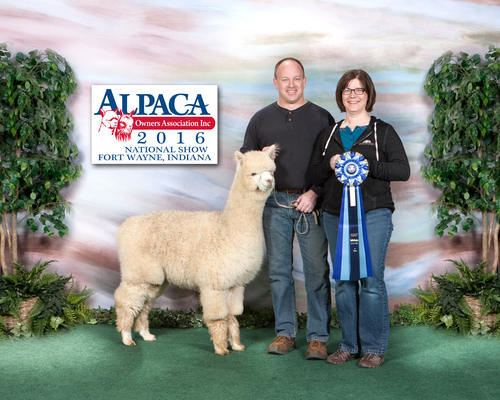 Drulon is the full brother to the HIGHEST selling alpaca ($21k) at the 2015 Breeder's Edge Auction, MFI & KVR's Peruvian Fila My Fleece. Fila has never been beaten at a show, with 2 CC's as a JUVENILE! Drulon looks EXACTLY like Fila, but I think that at this stage of development he is expressing more density, character, and larger bone! His dam, Prada My Fleece, is a multiple CC and RCC, which includes Futurity RCC! $8,500 1st Place 2016 Nationals! Take a look at this girl! Elegance is a gorgeous beige female with phenomenal fleece! 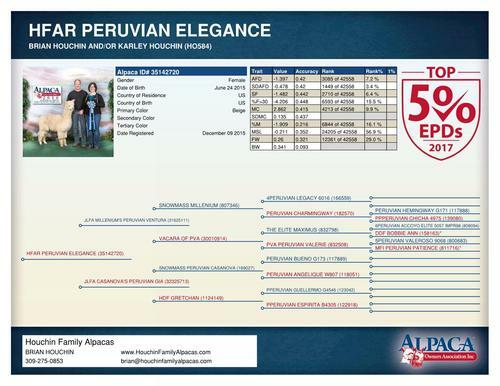 No surprise, considering her pedigree--Snowmass Millenium, 4Peruvian, Hemingway, Elite Maximus--all power-packed genetics! 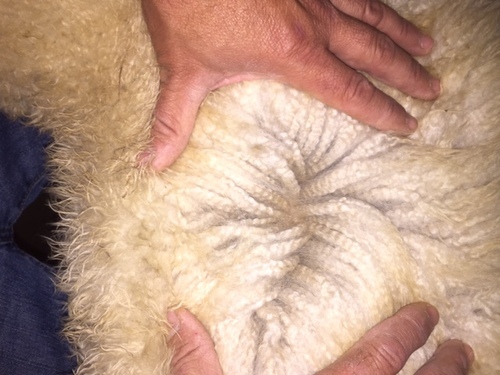 Her fleece is showing extreme density, excellent crimp, and extraordinary brightness. Take a look at the bundling! Elegance started her show career off with a 2nd Place finish at the 2016 IAOBA Railsplitter Show. She followed up that solid performance with a 1st Place finish the following weekend at the AOA National Show in a very competitive class of 6! She completed her spring show circuit with a 2nd place at the Wisconsin Show. Judges comments include extreme density in the bundles, with a fine consistent, fleece across the blanket. All of that with beautiful staple length and perfect confirmation! Update: 6/5/2108 - Elegance delivered a beautiful Medium Fawn Male! This boy has amazing fiber coverage and big, solid bone! Excited to watch this guy mature! 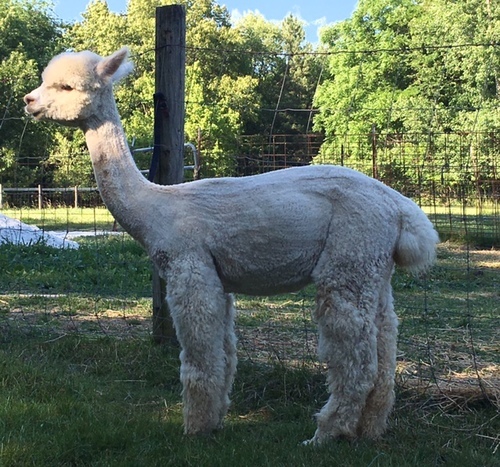 We have repeated her breeding to KVR's Drulon My Fleece for a September 2019 cria! We can work out financing arrangements that will fit your needs and budget.